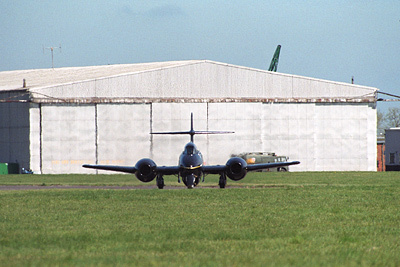 Martin-Baker's airfield at Chalgrove is a quiet place steeped in history. Sited next to a civil war battlefield (where John Hampden was fatally wounded in 1643), it was built during 1943 and was opened as USAAF Station 465 in 1944. 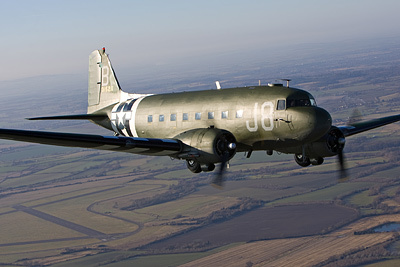 Home to reconnaissance and troop transport pathfinder units, types such as the P-38, P-51, A-20 and C-47 all flew from the airfield, which is to be found on the B480 in Oxfordshire, about 9 miles South-East of Oxford and 5 miles West of junction 6 of the M40. Chalgrove is home to Martin-Baker's two Meteors and their Beech Super King Air 200. 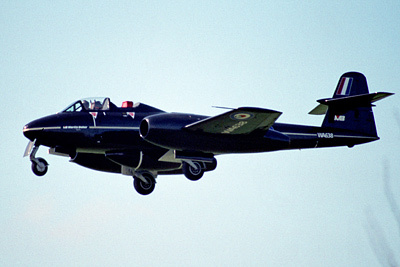 The Beech is used primarily for ferrying engineers between Chalgrove and the company's rocket sled test site at Langford Lodge in Northern Ireland, whereas the Meteors are used for live seat tests - both on the runway and inflight. If you're lucky you may see a Meteor flight but it really is pot luck and sadly due to security MB do not publicise flight dates and times. If you find a Meteor parked outside the hangar though, you can expect a flight to happen in the near future - they are always hangared unless ready to be flown or taxied. The first time I dropped by I was very lucky, and saw a Meteor flying (towed out of the hangar around 9:30, airborne from 11AM for about 20 minutes). 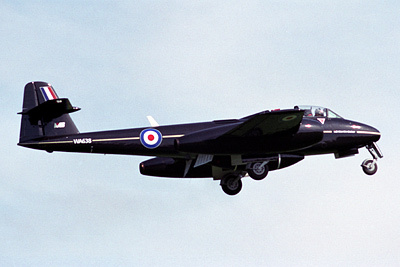 It is worth keeping an ear to the ground for any static appearances the Meteor may make at airshows or photocalls, as obviously it has to depart Chalgrove (usually the day before the show date) or come back (the day after any appearance!). Limited viewing possibilities and limited flying can make for a frustrating day out, but if you do get lucky reasonable photos can be had for the patient among us! 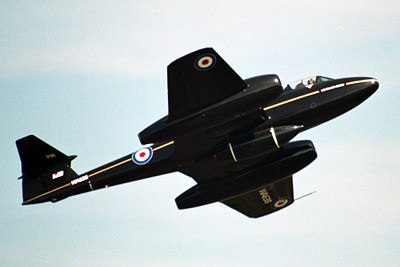 Plus where else can you see a Meteor earning its keep these days, other than at airshows? So, onto viewing... turning off the B480 down Monument Road, you'll soon see a small crossroads (point A). On your right is the large civil war monument. No doubt of more interest to this site's readership is a smaller memorial stone situated on the other side of the road due North of the monument. This is a memorial to the USAAF personnel who flew from RAF Chalgrove (Station 465) in WW2. The road it is on is also the entrance road into the Martin-Baker facility. The main gate and guard house is at the end, and if a Meteor is parked by the hangar, it may be within easy range of a camera here but you must ask the security guard for permission to point a camera anywhere. Even then you may be denied, and you certainly will not be allowed onto the airfield. Visits can be arranged by bona fide aviation organisations, with minimum numbers of at least 5 people (contact details below). Back on Monument Road, the next point to view any activity is on the extended centerline of the longest runway - 13/31. This is a fairly quiet road so you may be able to get away with pulling up close to the verge for a short time, but really you're better off either parking in the Monument Industrial Estate (just North-East of the battlefield monument, this site contains some old USAAF buildings once part of the airfield) or on the verge near the monument itself. Point B and its immediate surroundings are not too bad for shots of anything landing on 31 but little use for departures - normally turns are made to the North to keep noise away from Chalgrove village, so photography's fairly pointless. Chalgrove airfield is surrounded by high fences, often doubled-up, with a fair bit of foliage too, so there aren't many places where you can get close enough to the fence for photography. Continue down Monument Road towards the B480 and turn right onto it. Not too long past this junction there's a small turning on the left into a housing estate - French Laurence Way. Park in here somewhere (Point C). Now walk back out of the estate towards the B480, and turn left. Cross the road where the arrows are painted on the road surface and you'll see two wooden planks leading between two trees onto an allotment area. If anybody's here make yourself known and explain what you're doing - a little friendly heads-up won't hurt anybody. You can walk right up to the perimeter fence here (Point D), and between the trees dotted along the inside of the fence you can get a view to the hangar through the chain link (or bring a huge ladder!). Anything parked outside is within range of a long lens - 500mm for a passable shot - but heat haze can put paid to a good photo. Okay for serials though. Now if you're lucky and something is flying, it will taxi out towards you and come within reach of a 300mm lens. Runway 13/31 is the most often used one; 18/36 is rarely used because of noise considerations (and there are never any departures from 18 for this reason). If 31 is used for departure you won't be seeing much after the initial acceleration of the aircraft - if it's used for landing you'll have a split second where a landing aircraft is clear for a photo between trees obscuring the view either side. Anything departing from 13 will be airborne before you see it and will sail past you here still fairly low - you'll have a good opportunity to take photos until the trees to the right obscure the view (particularly in summer). Most of the taxiways surrounding the runways at Chalgrove are now disused - the only stretch still in use is between the hangars and the ends of runways 31 and 36, so a 13 departure will involve taxiing along the runway rather than the southern taxiway. For a better range of views across this side of the airfield, you have a bit of a walk coming up. Further West along the roadside the perimeter fence gets closer to the roadside, and at various points along it (e.g. point E) you can brave the rather uneven verge to get up close to the fence. Sadly these spots, limited as they are by the fence, are probably the best points to view any ejection seat tests too. These consist of a level flypast across the centre of the airfield with the ejection carried out in the middle - really too far away for good photos, and over all too quickly. If you know runway 06 is being used for arrivals (a rare occurrence), then return to your car and drive to Point F. You can park up clear of the B480, on the road leading out of the village and wait under the approach. This is unlikely to ever be worth it though, so off to a more useful spot. Continue along the B480 from point D, follow the first turn to the right (signposted for Lt. Milton and Rofford - there's only one other turning on the right prior to this, which isn't signposted and just leads to somebody's house and a crash gate - rather distant from the runway and down in a dip surrounded by trees, so useless for viewing). Go up this small road ignoring the first turning on the right (which once led to another crash gate but is now blocked by earth to keep it from being used as a dump). As this road is very quiet you can get away with parking up by the verge as long as you're well away from the corner at the start of the road. From here (Point G), you have a clear view of anything approaching to land on runway 13 and can walk up and down the road for different angles. 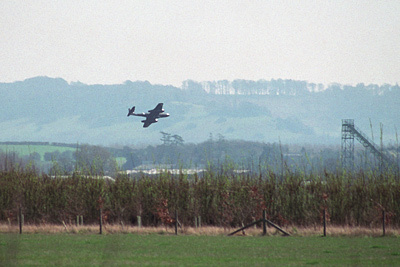 Unfortunately trees along the boundary of the airfield block your view of the runway itself. Just up the road a bit is a driveway leading to Rofford Hall; they don't seem to mind if you wander up this on foot and keep close to the driveway to look towards the airfield (e.g. Point H). However if you are stopped - be polite, there are no signs saying it's private property but that means very little - it's clearly somebody's land! I never ventured far from the second gated part of the driveway here as I didn't think it prudent to push my luck. That's pretty much it for Chalgrove when it comes to the more straightforward and useful spots, but there are a couple more to investigate if you think they may be of use on a particular day. For the first one, return to your car and continue driving up the road to the North. Turn right into Rofford Lane and continue down the lane to near the end, ideally before Rofford Farm which will show up on your right. Try and park in a considerate manner - if it means some distance away from the end, so be it! From here you continue on foot, and take the footpath to the left; this runs along the field edge and is initially some distance from the trees. This will lead you to Point I, which gives limited views of the airfield - mostly of use on the rare occasions when runway 06/24 is being utilised. The taxiway here is disused so all in all it's a spot that's not really worth bothering with. There is another spot near the end of runway 18 (Point J); it may be that you could reach it by walking around the perimeter fence from point I, but I have not tried to do so. There is a footpath that leads South to this point from Little Haseley village but that's a long walk. To reach it by car, you need to drive all the way back to Monument Lane where we began our tour and continue up Warpsgrove Lane and turn left onto the farm track. This may be a private road - certainly the other end (where it joins Rofford Lane) is closed off by a pair of gates. Anyway assuming nobody objects and you can find somewhere to park your car while leaving the lane clear for farm traffic, point J offers a view down runway 18 towards Chalgrove village. However with most (if not all) flying taking place on runway 13/31, you are hugely distant from any action. And that really is the lot for Chalgrove! A few small shops available in Chalgrove, nearest petrol is Stadhampton or Watlington. RAF Benson is around 15 minutes' drive away, cross-country - go into Chalgrove and follow the signs for Berrick Salome and later Benson. Contributors: author, Merv Thomas, John Kirby.